When the coals are getting hot quickly grill the zucchini and begin getting ready for this easy vegetarian starter. This is a wonderful hors d’oeuvre for a summer party or to enjoy with a simple gathering of friends. In a sauté pan over medium high heat pour in olive oil, add garlic stirring until just warmed,add diced tomatoes season with sea salt, stir, cook until just warmed through (less than a minute) add the pine nuts, mix, remove the pan from the heat, add brie, stir to combine, season with sea salt, place the warmed tomato mixture in a bowl, toss in the basil. Heat up the grill, in a bowl toss zucchini with olive oil and sea salt, grill the zucchini on both sides until almost cooked through, remove the zucchini from the grill just before they are done, as they will continue to cook a bit even after they are removed from the heat and you want them to remain firm enough to hold the bruschetta topping. Place the grilled zucchini on a serving tray and top with the tomato mixture. 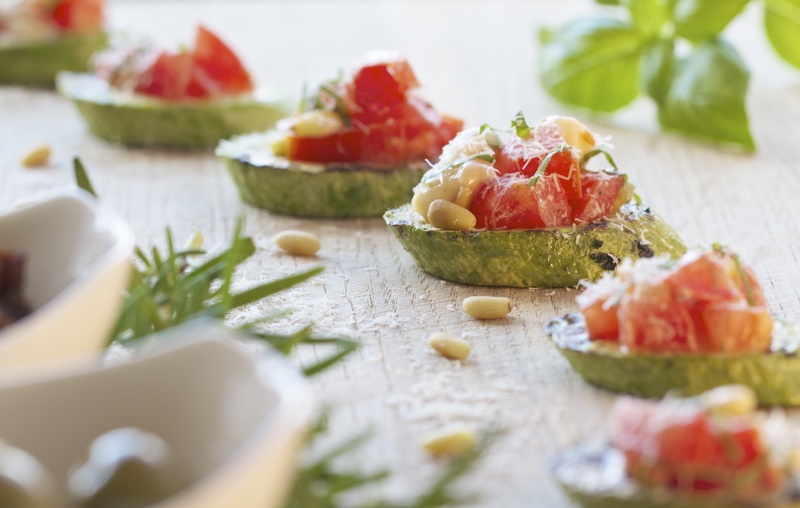 Sprinkle the grated Parmesan over the zucchini bruschetta and serve!